This toy spins like a top, rolls like a ball and rocks like a seesaw. 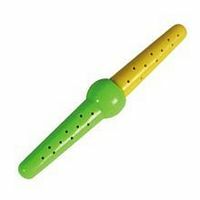 Made from hard plastic, it releases the catnip aroma through its numerous small holes. The Rock-N-Roller, which releases catnip aroma as it spins and rolls, will make any cat act like a kitten. Even better, this toy is refillable. Simply unscrew the two halves, refill with fresh catnip, and screw the two halves back together again.